Everyone loves chocolate covered caramel apples, but they are really expensive to buy. Now you can make your own at home and save a bunch of money. Now, you have no excuse to still go out and buy those overpriced Chocolate Covered Caramel Apples. You can make them at home and make them just as fancy as they do – maybe even better! 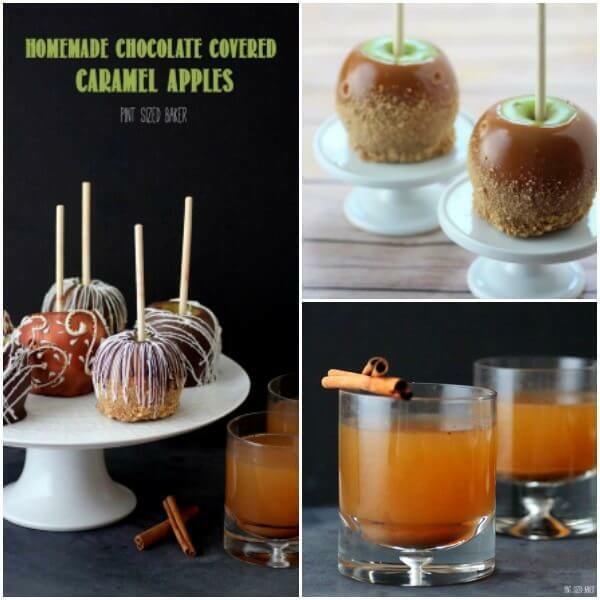 Fresh apples, homemade caramel, and fine dark chocolate come together in your kitchen. Everyone is gonna love them! They are a special treat that the kids are going to love for a fun movie night, bon fire party, or wrap them up and give them as gifts. You could “cheat” and use confectioners candy chocolate, but for these, we are going to temper our own dark chocolate. No “fake” chocolate here. Save that for the kids, the adults deserve the good stuff! First, you want to familiarize yourself with tempering chocolate. “What the heck is Tempering Chocolate?” Well, it’s heating the chocolate and cooling it again so that we get the coco butter and sugar correctly melted and mixed into the chocolate. If you made it through dipping your apples into the caramel and waited for them to dry, you are ready to move on to the next step of adding the chocolate. We want the chocolate to harden and remain solid at room temperature. We want the chocolate to “snap” when we break it. We want out chocolate to have a glossy and smooth finish. It’s actually easier than you think. Give it a try and let me know what you think. You can decide if you want to dress your apples up or down. Add nuts, candy, cookies, sprinkles, or even different colored candy coatings. Make fun ones for the kids and elegant one for holiday gifts for hostess parties. Skip the overpriced ones and make your own! 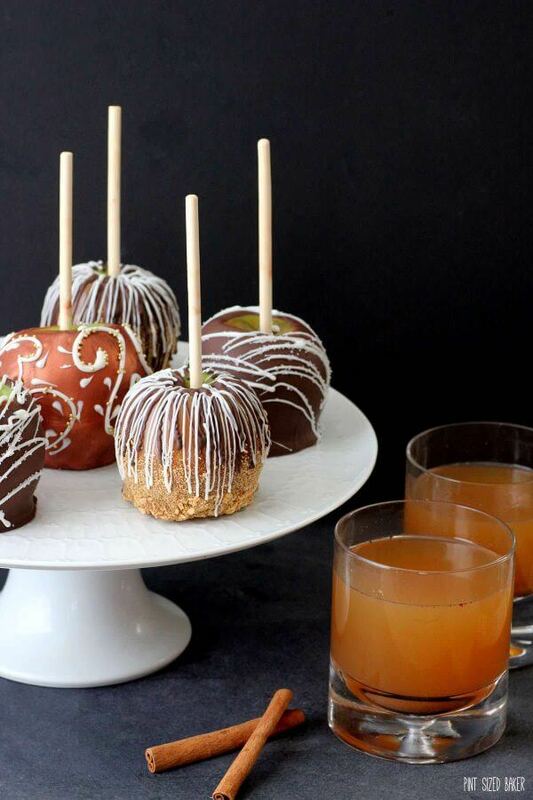 Fancy Chocolate Dipped Caramel Apples can be made at home. Chop your chocolate up uniformly. Place ⅔ of it into a clean, DRY top of a double boiler. If you don't have one, place a large glass bowl over a pot of simmering, not boiling water. The bowl should not be touching the water. Stir it until it melts and reaches 110. Remove from the heat and wait for it to cool back down to 95. Add the remaining chocolate. Stir it in allowing the heat of the melted chocolate to melt the solid chocolate while the solid pieces will cool the melted chocolate. Once it's smooth, it's ready for the apples. They should be dry and at room temperature. It's best not to refrigerate them if you are planning on adding the chocolate. 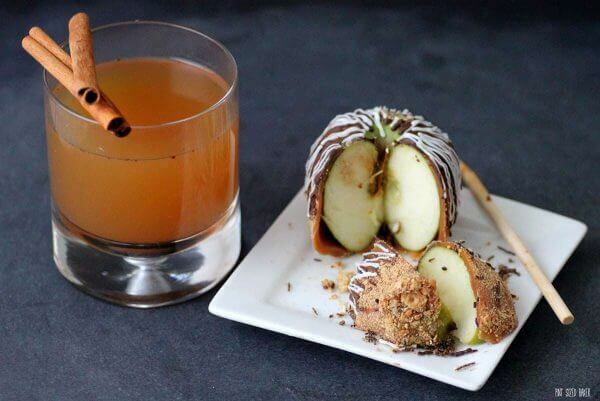 Dip the apple into the chocolate and turn it to coat. Shake off the excess chocolate and scrape off the bottom. Add any topping that you want to while still wet, then stand up on parchment to dry. Melt the White Chocolate Chips in the microwave at 70% power. Place some into a baggie with an edge snipped off and drizzle the white over to make a design. Add sprinkles if desired and allow to dry. If you want to add the copper luster dust, use a small dry paintbrush to brush on the luster dust. Add desired decorations. 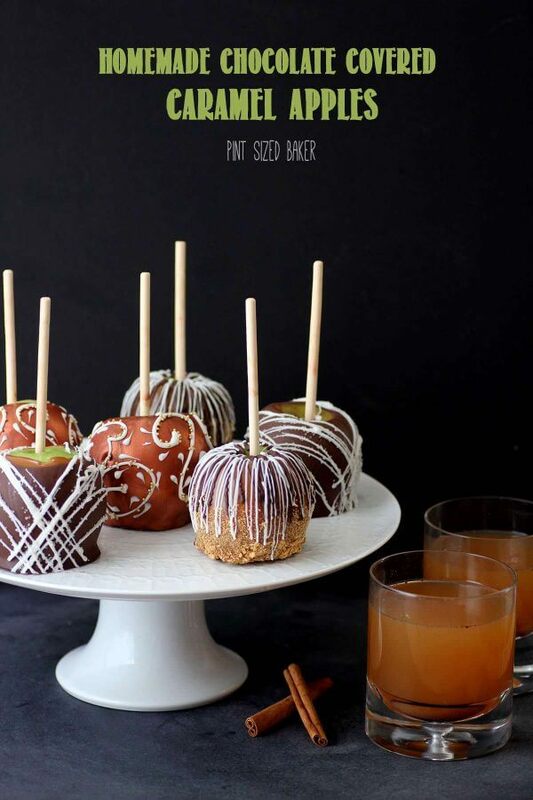 This recipe is part three of a three part series including Spiked Mulled Apple Cider and Caramel Apples. Thank you! Always appreciate the pin! Yummy! They almost look too beautiful for munching, but since caramel apples are some of my favorite treats…I think I could manage! 🙂 PINNED! They were wonderful! Go for it! These are really pretty. Pinned! These look like they should be in the window of a confectionary store! Beautiful! The caramel was dry in about an hour. I did not put them into the fridge. If you use candy melts instead of chocolate chips, they will harden quicker. Wow! 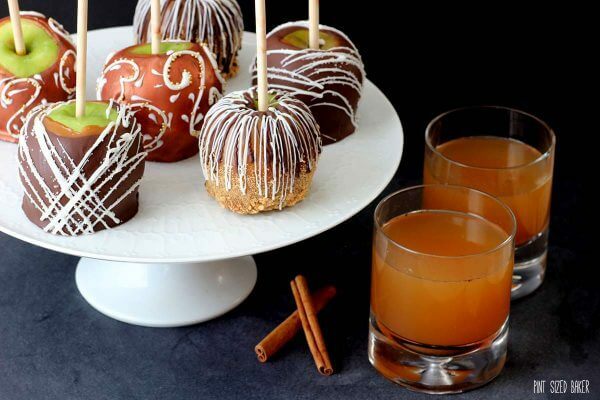 These caramel apples are so gorgeous!